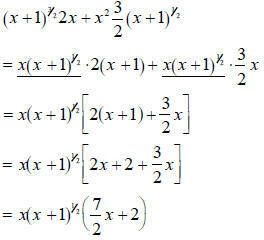 Example 2.1 Simplify the expression (x +1)y + 4xy by combining like terms. variables themselves—not just numbers. So what! Example 2.2 Simplify the expression by combining like terms. two products. Don’t give up—try again! now found one common term—the x—so this is a good start. We conclude the example by using this last deconstruction. you tell when you are done? these leftover terms cannot be split into products that have a common term. 2(x +1) as x · something. The ‘+1’ traps the x.
equal to the right-hand expression. The Zero Law is a way to turn more complex equations into two or more simpler ones. course we can do this with any number of expressions which are multiplied together. Example 2.4 Use the Zero Law to find the solutions of (x +1)(x - 2)(x -1) = 0.